Since Franklin D. Roosevelt pioneered the concept of “the first 100 days” in 1933 at the height of the depression it is generally believed that at the beginning of every new White House administration there is a 100 day window where the President is believed to have support from his recent electoral victory to put through his agenda in congress. Usually the President moves on difficult divisive issues or issues that are unpopular. Once the 100 days passes people tire, the victory is forgotten, and support tends to slip. So what are the chances that Obama will use the first 100 days of his second term to move on the UFO issue? This author was very skeptical that any such thing would happen in the first 100 days of Obama’s first term. The prediction turned out to be accurate. The second term, however, looks different. Obama’s recent actions seem to be giving off different signals that something might be in the works. Perhaps he will spend some of his political capital to take on the Rodney Dangerfield of all political and socials movements. Prior to his first term Obama rarely talked about anything not grounded in a socialist leaning of “taking care of the little guy.” When it came to less grounded issues such as the space program Bill and Hillary Clinton were giving speeches during the 2008 campaign that clearly predicted that an Obama election would be bad news for NASA and anyone else with off world interests. These predictions turned out to be fairly accurate as NASA would discover. When asked the question about “life in outer space” during an October 2007 Democratic debate Obama clearly pointed out that although there may be beings coming to Earth he was much more concerned with people who were already here on Earth that needed his help. The UFO issue had been discussed and Obama was now part of some sort of inside effort to support not disclosure but rather movement towards disclosure. Having been “read in” on the subject, Obama like Bill Clinton before him was simply interested in the issue and this interest was just bubbling to the surface in conversations and speeches. It is for this reason that Presidents like Bush Sr., Bush Jr. Johnson, Ford, and even Carter went through their entire terms as President never letting the words UFO pass their lips. Obama, however, broke this rule and started to talk UFOs and aliens. He did it, like past Presidents had, as part of a joke to avoid a reporter from taking the comment seriously an posing a question. Nevertheless, Obama chose to go down this road many times which is unusual. For the first three years Obama stayed quiet and then during an election year visit to New Mexico (which is often a swing state) Obama started the UFO trash talk. During a March 21st trip to Roswell, New Mexico President Obama came out with the following opening remarks to his speech. We had landed in Roswell. I announced to people when I landed that I had come in peace. (Laughter) Let me tell you – there are more nine and ten year old boys around the country when I meet them – they ask me, “Have you been to Roswell and is it true what they say? And I tell them, ‘If I told you I would have to kill you.’ So their eyes get all big…so…we’re going to keep our secrets here. A couple of weeks later in May 2012 Obama was again talking aliens this time with actor Will Smith while on a tour of the White House. Although this was a personal conversation Obama would have known that the story would get repeated and it would eventually become public – which it did. Obama continued with what is know as a Glomar response which is usually used by officials who have been briefed on a classified program but who cannot even acknowledge the existence of the program because of the level of secrecy. I can neither confirm nor deny the existence of extra-terrestrials,” Obama told Jaden,” but I can tell you if there had been a top secret meeting it would have taken place in this room. Someone asked me the other day if you had already found Martians. I told them we have to give you a little bit of time… If in fact you do make contact with Martians, please let me know right away,” President Obama said, “because I’ve got a lot of other things on my plate, but I suspect that will go to the top of the list, even if they’re just microbes. The final indicator that Obama may be working behind the scenes to open up the UFO subject is the appearance in the public of former CIA official Chase Brandon who came out near the 65th anniversary of the Roswell crash to declare that he had seen a box at CIA headquarters that contained material confirming to him ( and therefore the public if Brandon is to be believed) that the Roswell crash was indeed an extraterrestrial event complete with bodies. Brandon confirmed that he still is under contract to the CIA and that for 10 years of his 35 years at CIA (1995-2005) he held the job of the chief CIA liaison to Hollywood, making him the second most powerful official (director is 1st) inside the CIA make public statements on behalf of the agency. In terms of Obama, the important question to consider is -Why would company man Brandon throw the CIA under the extraterrestrial Roswell bus, after the CIA has gone 65 years covering up any involvement they might have had in the 1947 crash? Brandon stated that unlike his “science fiction” book on the Roswell crash which had to go through two reviews by a CIA review panel to change names and pull classified material, he did not tell the CIA he was going to turn them in on their Roswell involvement. Even stranger, Brandon claimed that after he went public to millions of radio listeners with his Roswell revelation, the CIA did not contact him to ask where he saw the Roswell material, ask him what he was doing, or remind him that he was violating his security clearance by taking about his discovery at CIA headquarter. The simple explanation that explains all these seemingly contradictory stories is the fact that the CIA approved Brandon’s Roswell disclosure that it was an extraterrestrial event. Brandon was just doing what he was told and he broke no security laws in the way that he put the story out. So how does this tie into Obama? Brandon in his half dozen interviews about the Roswell box was very specific in pointing out that the CIA works for the “people at 60,000 feet.” (President, executive branch, congressional intelligence committees) The CIA is contracted to provide intelligence, and therefore only do what they are told to do. They are answerable to the President and he is responsible for their actions as they work for him. Therefore Obama would have been very aware and would have to have green lighted the Roswell Box disclosure to the American people, as he would have been held responsible if the story had backfired with serious questions asked by opponents of the President in an election year. 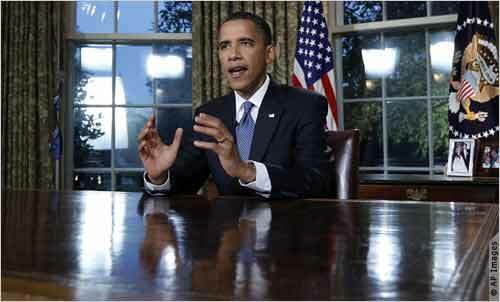 Obama was behind the story which seemed to be set up as a “Happy 65th Birthday Roswell”message to the public. Time will tell if Obama continues to drop extraterrestrial breadcrumbs to the UFO community and the American public in his important first 100 days of his second administration. If he does the efforts will probably continue to be indirect and surrounded by disinformation and humor. If he does it will be reported at The Presidents UFO Website.